Home » Posts Tagged "Madden NFL 13"
The Madden series has been critiqued and bashed with reckless abandon, “glorified roster update” comes to mind. 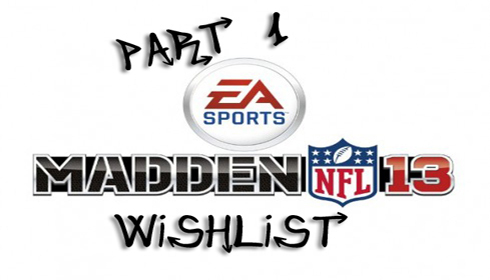 It seems EA and Tiburon over the past few years have been including more and more — the gaming community, to offer their feedback on how they could make the Madden series in general, but Madden 13 specifically better. I will speak on some things that I feel will make Madden fans very,very happy. On the podcast (Controlled Substance) we have a segment called “Letta 4 the Betta” and it’s our letter — in digital form to our favorite developers to give them suggestions on how to make their games — well — better. Consider this my letter — in written form to EA and Tiburon. The “real” Madden fans and football fans in general should appreciate this piece. Feel free to comment and give feedback CCU wants to hear from you. I will go into extreme details on what I believe will make the game better and why it will make the game better and hopefully we’ll get what we want. Let’s have some fun shall we? Part 3 is now live, also you can read the explosive part 1 and part 2. I will go into extreme details on what I believe will make the game better and why it will make the game better and hopefully we’ll get what we want. Let’s have some fun shall we? Part 2 is now live, to read the explosive part 1 you can click here. I will go into extreme details on what I believe will make the game better and why it will make the game better and hopefully we’ll get what we want. Let’s have some fun shall we?